"The fishing boat came in and was met by a seafood transport truck. I couldn't believe it when they opened the hatch, it was full of live crayfish! Caught by a Fisherman, prepared by a Chef. Take your taste buds to heaven with Tasmania's finest produce. Using nothing but the freshest of ingredients and local produce, Strahan's culinary delights caters for it all. Being one of the most isolated towns in Tasmania has its advantages. Located nearby, are some of the most famous ocean fishing spots in Australia. Crayfish, deep sea fish, shark and abalone are caught in these waters. If you have a craving for the local salmon or trout, smoked, poached, seared or fried; you will not be disappointed. These fish are caught straight from Macquarie Harbour and served fresh onto your plate at all local eatery's in town. Strahan has many dining out options, some of which offer take away menus straight from their restaurants. Scroll down for our recommendations and direct links to websites. Located in a peaceful cove, this haven allows guest to watch the spectacular sunsets, all while eating in a historical location that once was a commercial maritime centre. Themed with local pining family the Grinings in mind, Bushman's offers some of the regions best meals. Under new management of renowned Chef Steve Bennet and his partner Leslie, come and sit back, relax and enjoy a glass of Tasmanian wine whilst enjoying the harbour views. Hamer's Hotel offers a fantastic location, a welcoming atmosphere and relaxed bistro dining. Choose from eat in or takeaway menus featuring tasty local produce accompanies by a great range of Tasmania's wines and beers. Set on the hilltop overlooking the harbour, View 42 Restaurant and Bar offers superb views and a sumptuous dining experience. Wine cellar and afternoon tapas available (subject to seasonal dates). 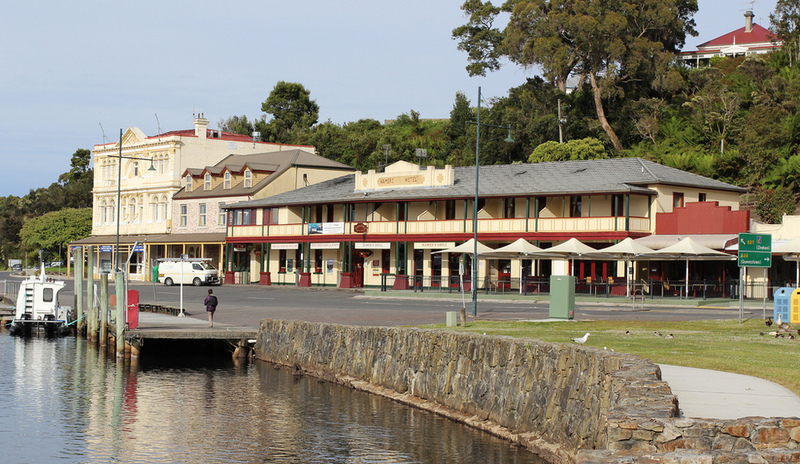 Some of the best Tasmanian Seafood can be sampled here. Located just 50 metres from the waters edge and offering 180 degree panoramic water views of the harour, The Tavern is the perfect location to watch some of Strahan's spectacular sunsets. Offering a family friendly bistro menu with local Tasmanian wines and beers available.